December 3, 2018 — The mad dash for the perfect Christmas tree has started and ensuring safety while transporting the tree should be at the top of this year’s Christmas to-do list. Data from a AAA survey indicates that approximately 20 million Americans who purchased a live Christmas tree did not properly secure it to their vehicle on the way home, increasing the risk of a crash and serious vehicle damage caused by dangerous road debris. 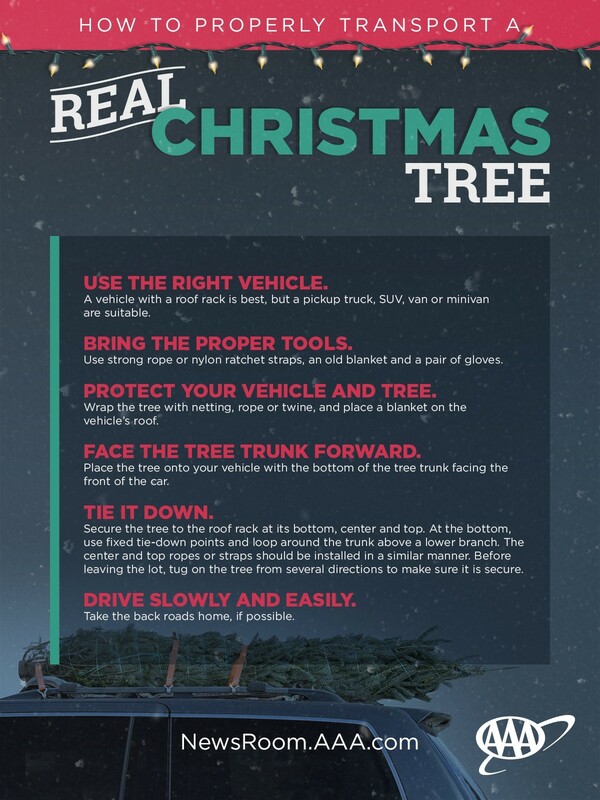 Christmas trees that are not properly secured are a safety hazard for others traveling our roadways. According to the AAA Foundation for Traffic Safety, road debris – which could include objects like improperly secured Christmas trees that fly off cars, landing on the road or on other cars – was responsible for more than 200,000 crashes that resulted in 39,000 injuries and 500 deaths over the past four years. And about two-thirds of debris-related crashes are the result of improperly secured items falling from a vehicle. In addition, vehicle damage that results from an improperly secured Christmas tree, such as scratched paint, torn door seals and distorted window frames could cost up to $1,500 to repair. various directions to make sure it is secured in place and will not blow away. Drivers can face hefty fines and penalties as well as jail time if an unsecured tree falls off their vehicle. “Drivers can prevent injuries and avoid penalties by properly securing their loads to prevent items from falling off the vehicle,” added Gamble.